Nobody can deny that the demand of more energy is increasing on a global scale. Over the last two decades we’ve seen different solutions to tackle this issue where renewable energy stands out mainly because of the need to reduce the impact fuels have in global warming and air pollution. Oceans are an incredible source of energy and till now has been under-utilised due to the high-cost involved, technical and environmental challenges. Floating offshore wind power may have a significant role in upcoming years providing energy to power our households and industrial facilities. These giant full-scaled floating wind turbines are massive conical steel structures, which can measure up to 254 m (846 feet). Investment along with collaboration between the different sectors that are involved in the different steps of the construction are needed, these not only helps to down costs but also to improve efficiency. This emerging technology in the wind industry has been successfully tested in a full-scaled floating farm located 15 miles (25 km) off the coast of Peterhead in Aberdeenshire, Scotland. The Hywind Scotland Pilot Park, which has five 6MV turbines with a total installed capacity of 30 MW, and a transmission voltage of 33 kV., has been developed and operated by Hywind Limited owned by Statoil whose principal activity is the development of renewable energy projects in the United Kingdom. Statoil (now Equinor), who has its origins in Norway, is one of the few companies that has been able to properly develop floating turbines since any wind farm in Norwegian sea have to be floating due to the depth of the ocean off the coast. 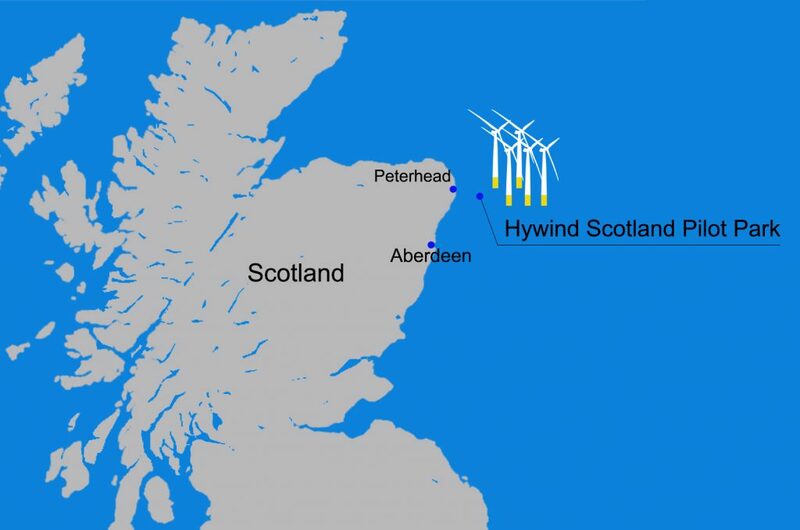 The technical potential is incredible higher compare to fixed structures, as for example The Hywind Scotland Pilot Park was able to reach 65% of its maximum theoretical capacity between November 2017 and January 2018 and will power 22,000 homes in Scotland when for a bottom-fixed offshore wind farm is 45 to 60% during the winter season. The resource potential is believed to be in deep waters where wind speeds are typically faster than on land. Just small increases in speed result in large increases of energy production. In so far, as this new technology evolves, much larger areas of the ocean could be used to install floating wind farms and not just along the coast. More developers recognise the optimistic future for the wind industry and are involved in floating wind demos around the world. The technology has been tested for a couple of years now and the costs have started to come down so it is expected soon more locations will be added including the northern part of UK, US, and Japan. Driven by this scenario, wind tower manufacturers can trust Faccin’s experience and successful track record of installed wind tower automation systems for their most exigent wind tower projects. 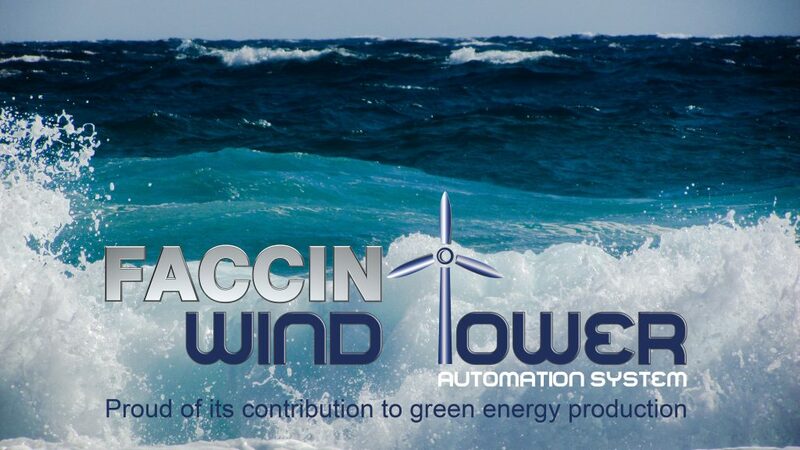 Bending hundreds of cans every month can only be accomplished with a rolling package like the innovative ‘Faccin’s Wind Tower Automation System’ designed to provide manufacturers with the reliability, precision and automation required in this type of manufacturing processes. The system is able to reach the floor to floor production time of 20min per rolled tube. It combines a powerful super-sized plate-rolling machine with key components like a strong side support, a sturdy top support and a feeding table with alignment device, all accessories controlled by a highly advanced fully programmable CNC designed to automate the most complex rolling projects. Reliability, speed and accuracy must go hand to hand with costs reduction, and the job should be accomplished by a single operator through the use of a user-friendly CNC capable of controlling automatically not only the machine but also the handling system. Our highly technological machines are designed to maximize the productivity, thus the profitability of the wind tower cans manufacturer. All this is achieved by a precise and fast rolling machine, which helps reduce time in the following steps of the wind tower assembly and welding, an oversized reliable structure able to work 24/7. The high level of supply availability and the lowest possible processing time is our priority. Installation and training are always provided in order to develop our customers skills. It allows them to operate confidently and independently in their day-to-day business. More than 200 years combined experience, forming today’s future. Faccin S.p.A. is a very powerful group which combines the best brands – Faccin, Boldrini and Roundo – in plate rolling, profile bending and dished-heads manufacturing, all united under one roof and offering the widest range of high-quality options available in the metal forming market. Header photo: Source Faccin S.p.A.